Joe Ehrmann is a former defensive lineman for the Baltimore Colts and the Detroit Lions. He and his wife Paula have four children and are cofounders of Coach for America, whose mission is to inform, inspire, and initiate individual, community, and societal change through sports and coaching. 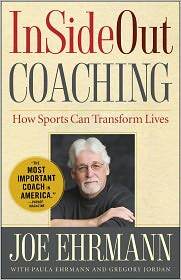 Joe’s new book InSideOut Coaching: How Sports Can Transform Lives was released on August 2 and is available for purchase on Amazon and other retailers. NFI: You start the introduction to InSideOut Coaching by telling a moving story about driving home one night with your young son, realizing how much you love him, and recognizing that your father never felt that way about you. Why do you think a father’s love plays such a crucial role in a child’s life? JE: Young people are hardwired to get that affirmation and love and acceptance, particularly from their dads, as well as their moms. Their basic self-concept of who they are is dependent on that relationship. Look at the tremendous number of dads who have abdicated that responsibility and leave children with huge questions about their identity and worth. Dads are one of the chief artists in painting the picture of who we are. As I travel the country, it’s the number one condition of children in America – it’s the lack of closure in those wounds as you grow from childhood to adulthood that continues to impact children’s relationships and identity. NFI: In an age when 24 million children are growing up with an absent father, we need dads mentor kids in their sphere of influence who need a father figure in their life. NFI calls this being a Double Duty Dad. How can coaches fill that role for their athletes? JE: Sports engage more individuals, families, and communities than any cultural activity, religion, or group. 20-30 million children play youth league sports and 10 million play interscholastic high school sports. 40 million children stand in front of the one of the most influential adults in their lives. Coaches have an unparalleled platform and position to formulate children’s self-worth and identity. When you have players who don’t have a dad, it’s an incredible opportunity to be an example of what it means to be a man. Coaches can teach what fatherhood is, what a dad looks like. Coaches have an opportunity to help kids make sense of their relationship with their dad. The challenge is that coaching has been reduced to win-at-all-costs mentality. NFI: Who was the most important coach in your life and what character quality of his made the biggest impact on you? JE: I played for coaches from age 10 to 36. I looked back and charted every coach I played for and graded them if they were transactional (transactional coaches use players’ athletic ability for their benefit) or if they were intentionally transformational in my life (transformational coaches change the arch of their player’s life – they understand that’s the responsibility that comes with the power of the whistle). The most influential coach in my life was my college lacrosse coach Roy Simmons Jr., a man of great empathy and compassion. He was an artist – he saw the aesthetics not only of sports but of life. Lacrosse was a Native American sport, so he taught us about Native American history and took us to art museums. He coached me in a way that I saw things in myself that I had never seen before. When I started thinking about my coaching philosophy, I knew I wanted to be outside of the traditional model so I looked back at him. JE: It’s based on attachment research. Attachment is the formation and maintenance of relationships. 40 years ago a psychoanalyst in Great Britain working with juvenile delinquents asked how some parents had the ability to enable their children to attach to them, or to relate to them, in a way that optimized their development, but some didn’t. The answer has to do with how a parent has processed their own story about themselves. It doesn’t matter how suboptimal or abusive your childhood was, if you make sense of it and integrate it, you are not destined to repeat it with your own children. My wife and I decided if that’s true in the parent-child relationship, it has to be true in the player-coach relationship. The biggest predictor of a coach’s ability to allow his players to attach to him in an optimal way is if the coach has processed his own story and understood the role of his father and coaches in the formation of his self-concept and developmental need. Once a coach develops his own narratives and makes sense it, it creates an empathic response to his players. The InsideOut process is building your own narrative by asking 4 questions. 1: Why do you coach? Is it about you or your players? 2) Why do you coach the way that you do? Is the way that you run practices and relationships with players repeating the way you were coached or are you trying to be transformational? 3) What does it feel like to be coached by you? What does it feel like to be a young person with all the pressures (psychological, social, sexual, parental, etc.)? What does it feel like to have you as a coach in the midst of all their developmental needs? 4) How do you define and measure success? Most coaches have none of these things written out or know how to think through it. These questions can only be answered with integrity from your own narrative and life history. When I started coaching, I had a clear purpose statement about the intent - why I was coaching, what I wanted to accomplish in the lives of my players. I coach to help boys become men of empathy and integrity who will lead, be responsible, and change the world for good. Every practice, drill, and game are designed to help fulfill that purpose. NFI: What motivates you to do what you do through Coach for America and your other initiatives, such as Building Men and Women for Others? JE: I’m a product of the 1960s – I was in college during the convergence of the civil rights, women rights, human rights, and war on poverty movements. I’ve come to the conclusion that there’s not a better venue to address these issues than sports. Sports are a metaphor for change. Secondly, I have my own narrative. I’m in touch with my own anger, abuse, and issues I’ve dealt with. I’m very empathic when I think about my own players. When my brother died, Victor Frankl’s book Man’s Search for Meaning was influential – he says that the greatest of all human freedoms is the ability to choose how you will make meaning out of your circumstances. I’ve taken the painful parts of my life and figured out how to make meaning out of it to help others. I’m making sure that at the end of my life, I will have been relationally successful and have left a mark to make the world a better place. For me that venue is sports and coaching. NFI: Anything else you want to share with us? JE: It is the moral responsibility of every citizen to step in when children have parents who can’t or won’t take care of them. That’s what NFI’s Double Duty Dad initiative is about – when you see children who are abandoned or needing, it ought to touch us. If there’s one problem in America, it’s an empathy deficit. That’s the result of the socialization process of men who are denied access to their feelings or emotions as they grow up. The three scariest words to a boy are “be a man” – we’re telling boys to disconnect their hearts from their heads. So when men become dads, they don’t have the empathy to connect with their kids, and that’s where the problems begin. We need to create empathy – humans are wired with empathy, it’s what separates humans from animals, but it needs to be nurtured. Thanks to Joe Ehrmann for taking time to talk with us! Check out InSide Out Coaching by clicking here.